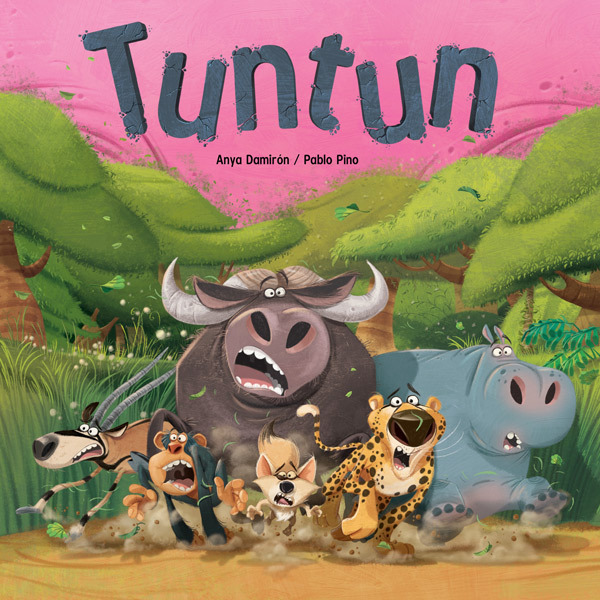 Tuntun is much more than a book, is a social impact project based on a children’s picture book written by Anya Damirón and illustrated by Pablo Pino. The book promotes inclusion and bravery with a fun-filled story full of action and colorful illustrations. But at the end, readers discover that almost all African wild animals they just saw are endangered, vulnerable or threatened species and we invite them to visit our website, motivating them to learn about all the wild animals that need our help, giving them an option to Do something about it. In here they will find: interesting facts about animals in an attractive way for the children, an animated video of the complete story (with original music), worksheets, coloring pages, a guessing game, a list of tips for us to help in our daily life and information about the first community sanctuary in Africa, www.retetielephants.org with a direct link to donate directly to the cause. We want to take readers a step forward. This website will be an ideal tool for children to learn more than the sounds of their favorite animals and to be aware of the impact we have on the preservation of all these wonderful species. The book will be published in Spanish and English, by Algar Editorial, both in America and in Europe, and will also be published in two versions of Catalan by the Spanish publishers Bromera and Animallibres. Anya writes, produces, story-tells, rents and sells picture books. She began her career as a writer in 2008 by launching a collection of picture books that motivates children to be curious, to dream, to invent and to use their imagination. Since then, he has continued to write and publish her books independently in the Dominica Republic. Over time, she started creating social impact projects around children's books and began storytelling having presentations every weeks in several malls of her country, achieving a positive change in her community. She also promotes family reading by sharing and renting her big collection of books from other countries with her project Renta a Cuento and now she has a book corner full of books curated by her where families can go read together for free. Algar is a publisher specializing in children's and young people's literature with more than fifteen years of experience. Its catalog includes diverse collections, among which stands out the one dedicated to picture books, an area in which Algar has become one of the reference labels on a Spanish and American scale. Jonnathan began his career in animation in 2000 working as an animator and visual effects artist for television commercials. In 2006, Jonnathan started his independent project by opening the doors of bingostudio, an animation studio and visual effects. Today, with his vast experience in 3D animation, 2D and visual effects, he has been responsible for important projects for commercials, video clips and both local and international films. The animation of characters, both 3D and 2D, has always been his passion and he puts special interest in projects of this type that have as main receptors children, young people and the whole family. Pablo was born in Argentina in August 1981. He draws from a very young age, like most children. He trained in a self-taught way and has worked professionally as an independent illustrator since 2006. He works in different graphic media, but what he likes best is to illustrate for children and young people. Today he has illustrated more than 50 literature books and collaborates designing characters, album covers, board games, magazines and school books for publishers in America and Europe. Composer born in Santo Domingo, Dominican Republic. In 2013, he worked with director Joe Menendez on what would be his first feature film, "Quiero ser fiel," and which, recognizing his talent, entrusted him with the composition of his next film, the Lionsgate / Pantelion action comedy, "Ladrones ". He collaborated with director Taba Blanchard and actor Manny Pérez for the music of the film "Veneno" which premiered in 2018. Her attraction for the arts and the scenarios began at an early age through Dance as her first passion and profession. She later graduated in Advertising from the APEC University and later obtained a Master's Degree in Production and Entertainment Management at the University of Barcelona. Her primary focus as a professional is always to deliver more than what is expected, this being the secret of countless productions. Today she is the second half of Once y Once together with Jose Antonio (Nono). Passionate musician, creative and enterprising by nature, he began his professional training with a degree in Business Administration at UNIBE and a master's degree in Advertising in the city of Madrid, has been the mastermind behind shows that have created new trends in the local industry, marking new standards and turning each event into a communication tool through the creation of unique and unrepeatable experiences. He currently directs Once and Once with María Eugenia (Mariu). Born in the Dominican Republic, he graduated in advertising at the Catholic University of Santo Domingo (UCSD). Has worked in the most important advertising agencies such as Leo Burnett, Oveja negra / TBWA, Saatchi Saatchi Summit, Interamerica Lowe LIntas among others. As a young man he was the creator of a magazine where he met his second passion photography. Step by step, he enters the circle of entertainment, where he has had the opportunity to work with several artists as an art director and photographer. Doctor of Medicine and Bachelor of Interior Design. Self-taught environmentalist for 20 years. Teacher of subjects of sustainability and quality of life in UNIBE since 2006. Creator of the weblog paolatineo.com, where she provides advice for a healthy and eco-friendly life. Chatter about sustainability and eco-friendly life, for children and adults. As a member of the Environmental Network of Dominican Universities, RAUDO, trains Higher Education teachers on the topic of Climate Change. She is a consultant to the Dominican National Commission for UNESCO (CNDU). Founding member of the Fundación Ser Eco, non-profit organization, dedicated to raising awareness of the importance and benefits of connecting society to nature, in order to transform each human being to live in a sustainable manner. Dominican announcer, presenter and actor. Known for his participation in the films La fiesta del Chivo, The Lost City and Tropic of Blood. It is the official voiceover of the HTV channel, Co-host and producer of the Chevere Nights show and producer, broadcaster and founder of the 12y2 radio program in Santo Domingo. I adore all the children in my life- nieces, nephews, cousins and friends' kids and I try to spend as much time with them as I can! I have a degree in Early Childhood Development/Education & Sociology. I was a Preschool teacher and Nanny for over 10 years, until I had back surgery(actually 2!) which kept me from working and eventually led me to start Opposite of Far! We take pride in carefully hand making high-quality items for children. Entrepreneur and creative since 1990. Her first camera was at age 15 and photography was always her hidden passion. He studied Advertising Communication; and after working as a graphic designer, she founded and developed the accessories brand Ela Design Studio, one of the first online stores and digital brands in the DR. In 2016 she decided to start with her sister Nathalia the project of TKI Studio, a photography studio, product styling and stop motion animations, which is responsible for the visual content of social networks of several local brands. Cesar Fernandez is a self tought Nature photographer with an instinctive approach to exposure and composition. His passion is driven by his undeniable love for Nature and Wildlife: "I photograph what I love and inspires me, and nothing exalts me more than Nature and the outdoors". He has no prior education in art or graphic design but his body of work depict an exeptional talent and unique style that have earn him numerous awards and recognition. His images have been showcased in numerous publications and exhibitions. Born in Dominican Republic, currently living in Gadsden, Alabama. Tuntun is huge but he doesn’t know it. His footsteps scare all the other animals of the jungle, who think of everything before being brave enough to face the truth. Tuntun, reminds us that many times, things are not as we think. A daring wasp realizes what is really happening and takes action in an unexpected way, causing an accident that changes the jungle completely. Things are never the same again. 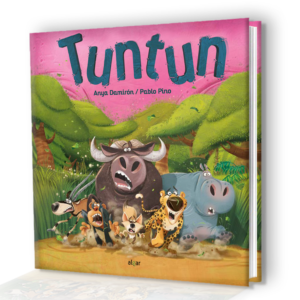 Tuntun gets to know all the animals, discovering that he is not alone in the world and the animals begin to live wonderful adventures with his new friend. Tuntun represents everyone who is a little different, all those species in danger of extinction, which are gradually disappearing. It represents with its greatness those who feel lonely in the world, who are judged by their appearance and those who wish they had an opportunity. Enjoy the hardcover edition of this funny story, published by the European publisher Algar, with 64 pages and a poster included. This is a project created in the Dominican Republic. Click here and enjoy special prices and products for this country.If you are outside of the Dominican Republic, please click here. African Wild animals are much more than their sound. In here, you will soon learn interesting facts about all of them! We have partner with Reteti, the first community sanctuary in Africa to give you a way to DO something about it. Big things happen when small actions get together. The Reteti Elephant Sanctuary, is the representation of the communities standing up united for wildlife, in recognition of the value that they can cultivate. It takes in orphaned and abandoned elephant calves with an aim to release them back into the wild. This is the result of a widely recognised and expanding grassroots movement of community-driven conservation across northern Kenya; a movement that is growing new economies, transforming lives and conserving natural resources. Your support will help these iconic animals and the communities that care for them. Take a peek of what’s happening in the production of this project. New challenges are always less difficult when we have the support of our friends to achieve them. Share our project with your friends on your social networks!